is labelled and hung on the wall! So I am going to "Officially" call it Finished. Perri is going to kit it up if you are interested. Pop on over here and let her know. Your quilts are beautiful, as are those adorable labels. How do you make your labels? Magnificent Sharon!! as far as I am concerned you deserve to be able to talk about this beautiful quilt forever and I don't think there will ever be too many photos of it. You are amazing. OMGoodness.....that quilt is gorgeous and soooo worth the wai you must bring it for show and tell to the next Mill rosie meet up! Well done and I agree with marina you can never have too many photo's of this beautiful quilt :) Barb. 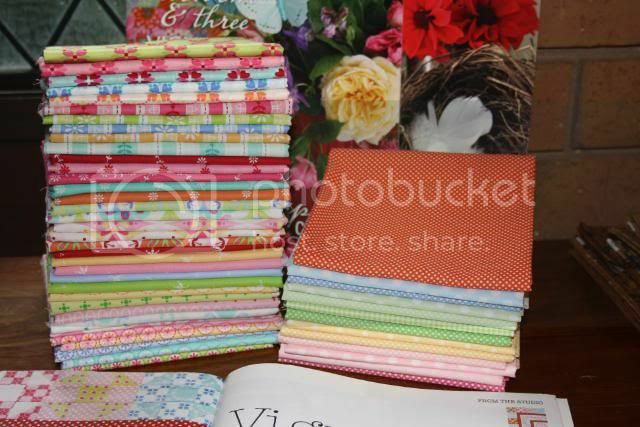 You are living proof the Vignette Quilt can be finished. I commend you on your perserverence! I should pull mine out and get working on it again. You have created a true heirloom for your family. It is beautiful! WOW, I am in awe Sharon. This is such a work of art. Well done, it is so beautiful. Congatulations Sharon.. Your quilt is gorgeous. Sew many hours of loving stitched into this beautiful quilt. I can't get that vignette magazine in the UK. Absolutely gorgeous! Your work is beautiful! Your quilt is just beautiful. It is massive too (bigger than I expected it to be). Oh, Wow!! Congratulations!! It's so pretty, and I just love the label you made for it. Very happy for you. A LOT of work in this, and you stayed the course! Beautiful work to be admired every day. Absolutely gorgeous...and makes me wish mine was done. I won't be starting the next one unless I finish one of the other two of hers I have started, that is until I see it and want it too. Congratulations on a job well done! Absolutely beautiful!! Congratulations on a gorgeous finish. And top marks for staying power!! This quilt is absolutely stunning, Sharon!! You shoud be very, very happy with yourself!! I'm sure proud of your incredible accomplishment!! Congratulations on getting it Finished it looks Wonderful on your Wall. Your quilt is just stunningly fabulous! Your colors are just wonderful! This would be a great one to do if you had the magazine readily available. Congratulations Sharon, tis a gorgeous quilt!!! It's magnificent Sharon, you must be so pleased. Looks great on the wall too. It looks amazing Sharon! Love it. I think you need more than a drum roll. You need a gold medal. This quilt is amazing!!! I love it. I am back at the tracing stage. You must be so proud of yourself for this finish, its an amazing effort with a lot of love and hard work. Just fabulous. A huge Bravo for your finish !!!! I'm completely in admiration.... still trying to stitch my blocks 2 and 3 .... and can you believe I can't wait for the next mystery quilt that Leanne will propose us.... it's a serious illness, isn't it !! Congratulations - your quilt is beautiful - I can't believe you've finished - inspirational (must dig mine out and prevent it from becoming a UFO) - I will look back at yours every time I feel disheartened! It looks amazing - you must be so glad its completed. How did you quilt it? However you did it, the quilt looks so beautiful in your photos. What a beautiful quilt! I simply love it! Well worth the time it took to complete it. May i ask were you have your labels printed? Did you quilt the quilt yourself? If so did you do it by machine or hand? So beautiful! Your quilt looks great. Congratulations it is a lot of work. Beautiful quilt. All that detailed stitchery is a work of art.